To be or not to be, that is the Shakespearean question confronting Tom Benigno. He wants to be west suburban Norridge’s $50,000-a-year village president, and he currently is Illinois’ $165,000-a-year deputy secretary of state. A tough choice. Wait a minute. This is Illinois, the "Land of Clout," not England in the 1500s. Why can’t one be AND be? In Illinois, any reasonably intelligent young Democrat with a clout-heavy father can grow up secure in the knowledge that he is assured not just one good, well paying job on the state, county or city payroll, but maybe even two — at the same time. It’s the American Dream. "I’m resigning my (state) job after I’m elected" on April 4, Benigno pledged. Benigno has been Jesse White’s top aide for 18 years, and he runs the sensitive patronage and vanity license plate operations in the office. When Democratic politicians want a favor, or want to do a favor for a constituent or donor, Benigno is their go-to guy. When White announced in 2016 his retirement in 2018, Norridge looked like a soft landing for Benigno, who already has county and state pensions. However, White, age 82, is under intense political pressure to unretire. "He’s thinking about it," White spokesman Dave Druker said. That means that he’s running. A 2018 Democratic primary for White’s job would be nasty, expensive and racially divisive, pitting the forces of Mike Madigan against Toni Preckwinkle, who would support different black candidates, with a white Downstate candidate in the mix as well. According to sources, both Democratic powerhouses have beseeched White to run again, and if he does, he will clear the primary field and be re-elected easily. Of course, if White wins a record sixth term, pressure will be intense on Benigno to stay on and continue running the office. "White will run and Benigno will stay," asserted James Chmura, the current Norridge village president who beat Benigno 1,910-1,403 in 2013, getting 53.4 percent of the vote in a three-way race. Chmura said that Benigno would be an "absentee" mayor and that White is "delaying" his announcement until after April 4. One of the reasons that Benigno, age 61, lost in 2013 — and there were many — was that he foolishly said that he could perform his municipal duties evenings and on weekends, keeping his day job. He also imported a bunch of rather intimidating precinct workers from Madigan’s 13th Ward and from the moribund 36th Ward organization, once run by Jim DeLeo and Bill Banks. There are only 10 precincts in Norridge, and the Benigno "volunteers" where stumbling all over each other. "They were outsiders, the voters knew they were outsiders, and they resented them," Chmura said. According to financial disclosures, in 2013 Benigno spent $118,000, to $70,000 by Chmura’s Norridge Improvement Party. As of Jan. 1, Benigno had $48,168 in campaign funds on hand, and Chmura had $75,737. Benigno is a product of George Dunne’s 42nd Ward, where holding multiple jobs is a tradition. White had a county job during the 18 years he was a state representative. Asked why he thought he could beat a 4-year incumbent in 2017 after bungling the 2013 contest. Benigno said, first, the village "needs change," noting that Chmura’s party has been in charge since 1951. Second, he said that he created the Norridge First Party and that he is running a slate for clerk and three trustees. "In 2013 I ran by myself," he said. "Now we have a team." Third, in a blistering "Dear Neighbor" letter, he accused Chmura and his "rubber stamp" trustees of "failed job performance," alleging that "crime is up," that there are "fewer police officers . 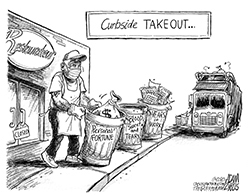 . . on the street," that Chmura sought "a massive tax increase" for school construction (which was rejected in a referendum), that Norridge business "is stagnant" with "vacant store fronts" and "no plan to bring new businesses," and that Chmura is a "part-time mayor . . . more concerned with going to Florida." The "Mr. Nice Guy" of 2013 is the attack dog of 2017. "Lies . . .all lies," said Chmura, age 65, who was Norridge’s chief financial officer prior to 2013. Benigno is not using the "Madigan Method" playbook, which works like this: Find some kernel of truth, twist it, embellish it, and attack with it. For example, in the 2016 Mike McAuliffe-Merry Marwig campaign, a measure which passed nearly unanimously in Madigan’s House of Representatives, with Democratic support, allowed a convicted sexual predator, if a parent, to attend their child’s school events with the consent of the school’s administrators. As a result, mailers blared that "McAuliffe wants to allow sexual predators in schools." Benigno’s handlers aren’t even looking for a kernel. They’re just making stuff up. Lie Number One: There are "fewer" police, which is why "crime is up." In 1981 there were 39 officers; there were 37 in 2013, and now there are 35. That’s a 10 percent reduction in 35 years. 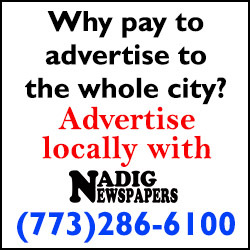 Norridge’s population is 14,572, spread over 1.8 square miles, generally covering an area from Harlem Avenue and Irving Park Road northwest to Cumberland and Foster avenues. It has 10 precincts, with about 1,455 people each. A quarter of the land area is occupied by commercial enterprises, which generate steady sales tax and property tax revenue to the village. Chmura said that there are always two squad cars on patrol, with one always dispatched to the area around the Harlem-Irving Plaza shopping center during business hours. "Unlike many cities, we prosecute shoplifting," which produces a spike in arrests, Chmura said. Benigno said that the Lawrence-Cumberland area has had a surge of home invasions, but he provided no statistics. "There’s been no crime increase," Chmura said. Lie Number Two: Norridge is economically "stagnant." Chmura emphatically rejects that accusation, noting that a $27 million "Norridge Market Place" redevelopment of the 2-acre site on Harlem Avenue formerly occupied by the Norridge Theater, vacant for more than 6 years, will include a new AMC Theater, plus a pub and restaurant on the former Lenell Cooky Company site. Chmura said that 23 new businesses have opened in the village during his term, including 15 restaurants or bars, two bakeries and a liquor store, plus an "X-Sport Fitness" at the shopping center, where the 140 stores are 98 percent occupied. A Sports Authority and a Nordstrom Rack are coming. Those enterprises generate more than $500 million in sales, and Norridge gets 1 percent of the tax. "If that’s stagnation, we need more of it," Chmura joked. Because of that revenue flow, 76 percent coming from sales taxes, there are few pass-alongs to property owners. The budget is $19 million, of which $12 million to $13 million is spent, with 7 to 12 percent from property taxes; the village property tax levy has remained at 3 percent, and there is no municipal bond indebtedness. There are no village bottle, soft drink or plastic bag taxes or fees, no revenue stamps on home sales, no unionization of the 150 city workers, no tax increment financing districts, no 911 surcharge, no garbage collection fees, free garbage carts, vehicle stickers for only $10, a $5 million reserve fund, and a AAA Standard and Poor’s rating. If heaven were a suburb, Norridge is where the pious would end up. Norridge is ripe for a "hostile takeover," Chmura said, with millions of dollars going to lawyers and consultants and new debt to finance private projects for insiders with clout. Lie Number Three: "Schools are decaying" and Chmura’s "ill-advised plan" was "to raise OUR taxes." That was beyond egregious. There are four grammar schools (Giles, Leigh, Pennoyer and Union Ridge) and one high school (Ridgewood) in the township, but School District 80 decided it needed $6 million for a new school and sought bonding approval from the Norridge Board, which was denied. The $6 million would have added up to principal and interest of $60 million. The measure went on the ballot in 2016, Chmura opposed it, and it lost 77-23 percent. Lie Number Four: Benigno is a "community leader," which was trumpeted in Feb. 6 solicitation from "Citizens for Benigno." According to Chmura, there have been 80 Norridge board meetings, 22 per year, since he took office. He said that Benigno "has shown up for two," the meetings on the District 80 bonding. "He knew I opposed it, he was there, and now he’s lying about it," Chmura said. Benigno’s spokesman said his candidate stands by his charges. Another factor is Democratic ardor for "payback," inasmuch as Chmura had the temerity to endorse and campaign with Republican McAuliffe in the tempestuous 2016 20th Illinois House District race, in which Madigan recruited and funded Marwig. McAuliffe won Norwood Park Township 2,942-1,783 (with 62.3 percent of the vote), and he carried all eight of the Norridge precincts in the district. "I am nonpartisan and not a Republican," Chmura said, but he said that McAuliffe "has done a good job, supported capital financing, and deserved my support." How Republican is Norridge? Hillary Clinton defeated Donald Trump 3,268-2,884 (with 53.1 percent of the vote). In 2012 Barack Obama won 2,650-2,229 (with 54.3 percent). Bruce Rauner won Norridge in 2014 1,918-1,402. About a third of the voters are seniors, and about half are of either Polish or Italian descent. That a very conservative electorate. Benigno’s recent fund-raising solicitation avers that he is "well ahead of his opponent" and that he will not have any fund-raisers, so just send money to "put the icing on the cake for his election." "Neighbors matter, not money," Chmura said. My prediction: Chmura will win, White will run, and Benigno will keep his comfy day job until 2022.